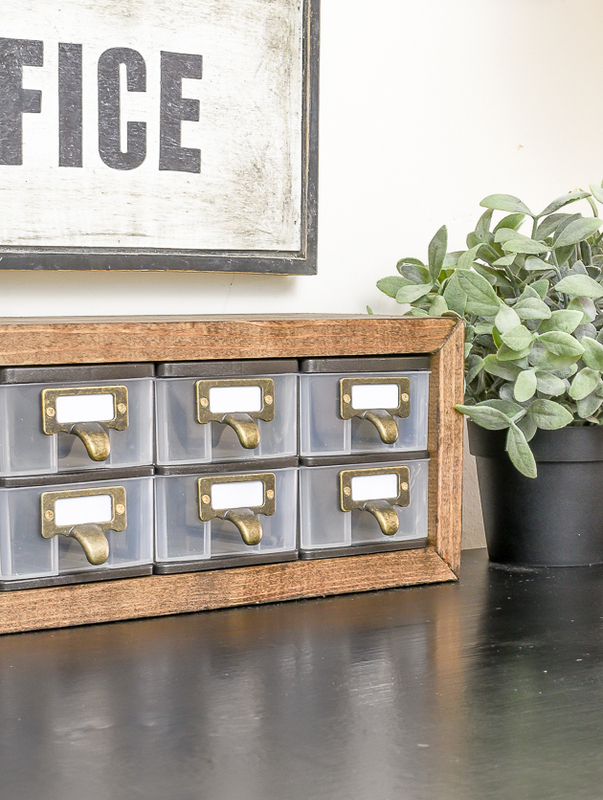 Give your generic plastic storage organizers an industrial farmhouse makeover in just a few simple steps! 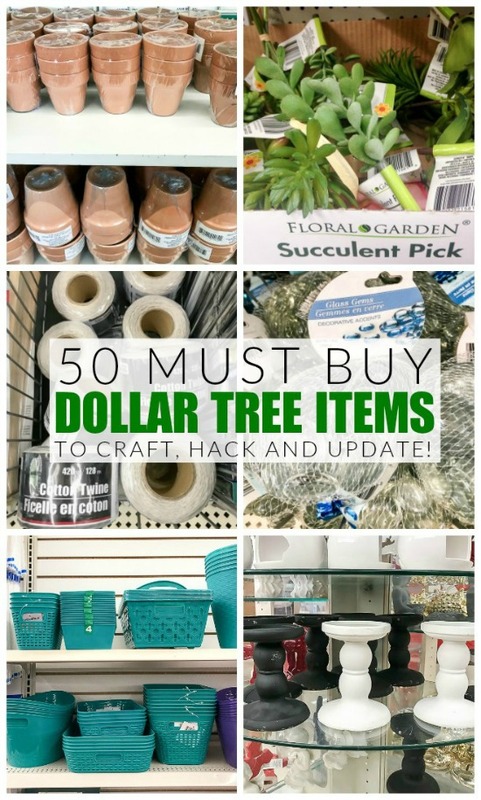 I'm a few days late for Monday's Dollar Tree makeover, but I was still on vacation mode and soaking up every last minute of the holiday break. Now that the kids are back to school, it's back to work for me. If you follow me on Facebook or Instagram, you may have seen the picture I shared of my office just after Christmas. It ended up being a dumping zone for everything that came into our house and it was a total disaster. 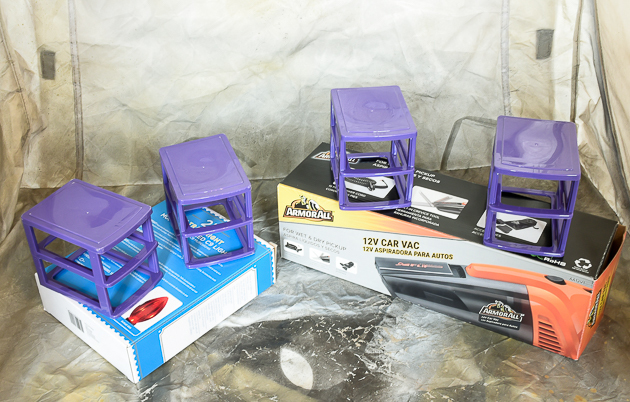 Since blogging is now my full time job, I was determined to get by office clean by January 1st. 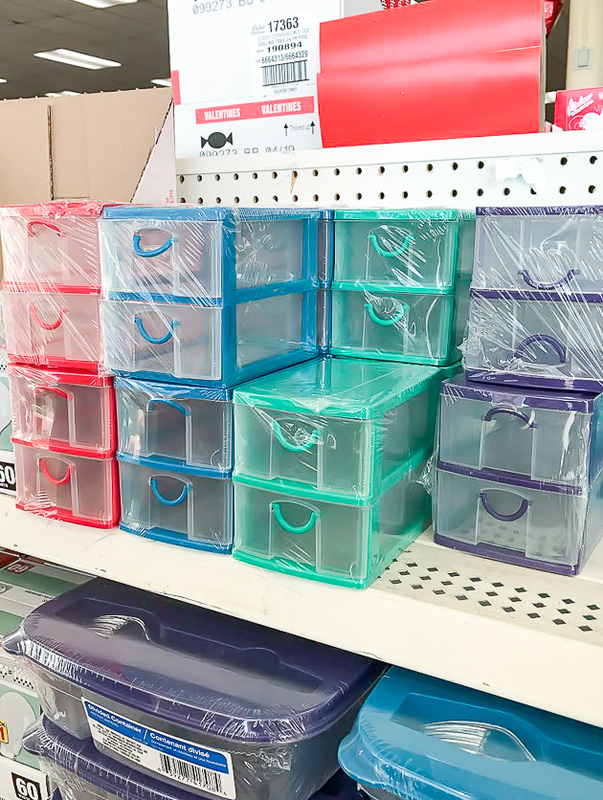 Thankfully, I not only managed to get everything put away, donated and organized, but I also created new inexpensive storage with Dollar Tree bins. 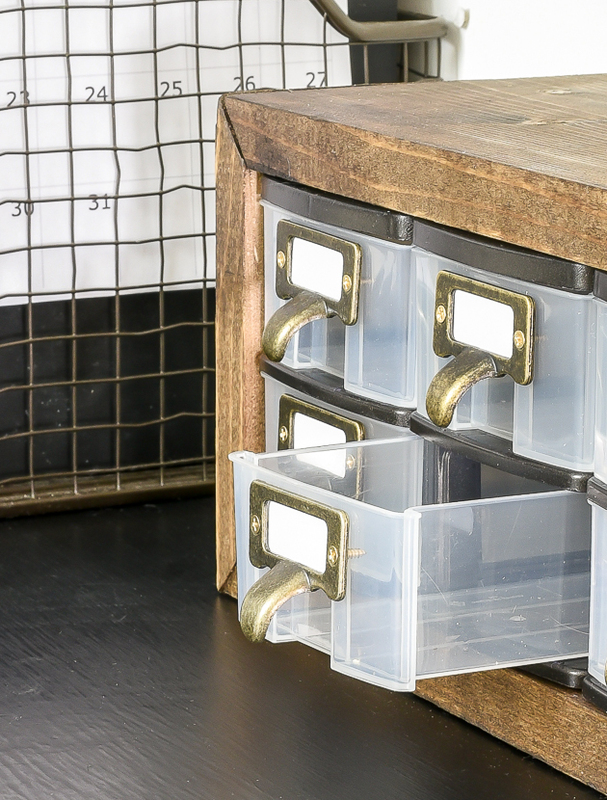 You may recognize these little storage drawers from when I updated a set last year. 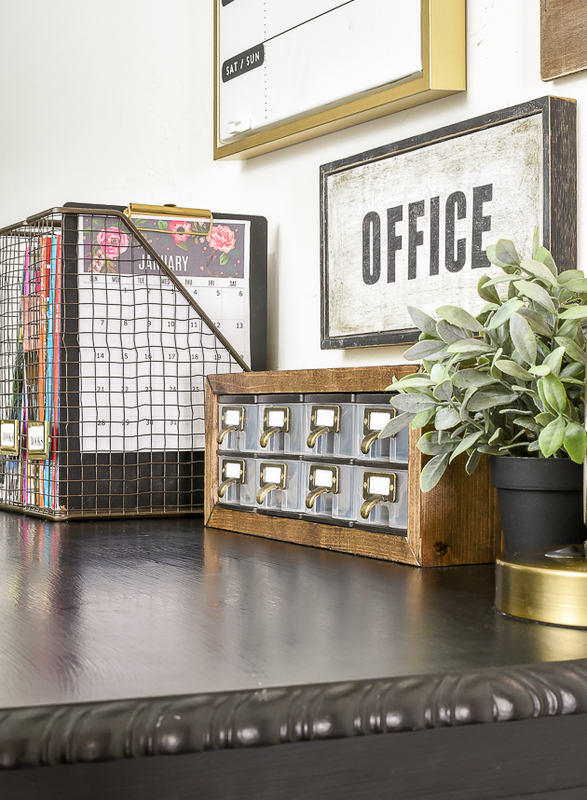 They are one of my favorite Dollar Tree storage makeovers and I really wanted to try another version of the update this year. 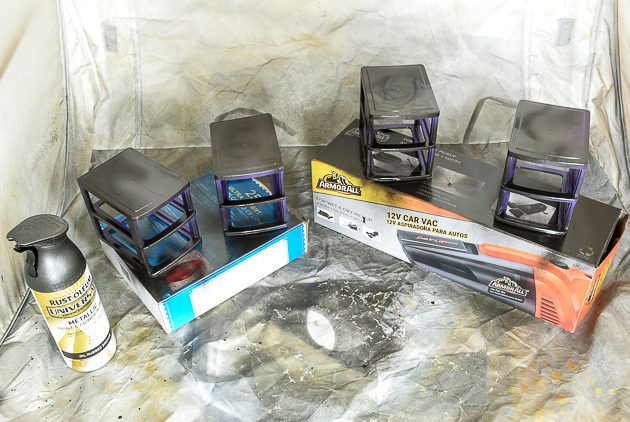 I decided to go horizontal with the bins instead of vertical, which meant I needed to make a box for them to sit in for a more finished look. 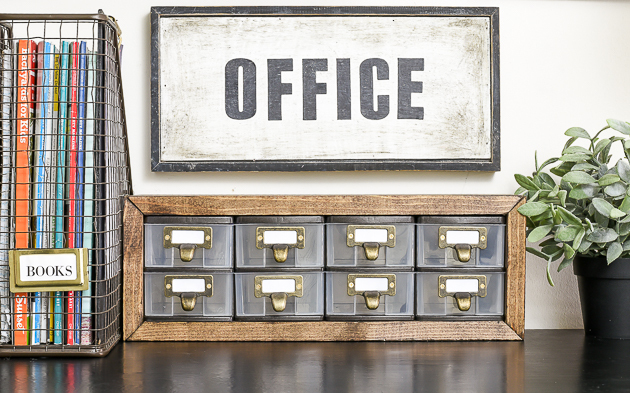 I ended up using a 1x6 that I cut into four pieces to build a frame around the drawers. After my wood was cut, I very lightly sanded the frames of the drawers then sprayed them with a few light coats or ORB spray paint. 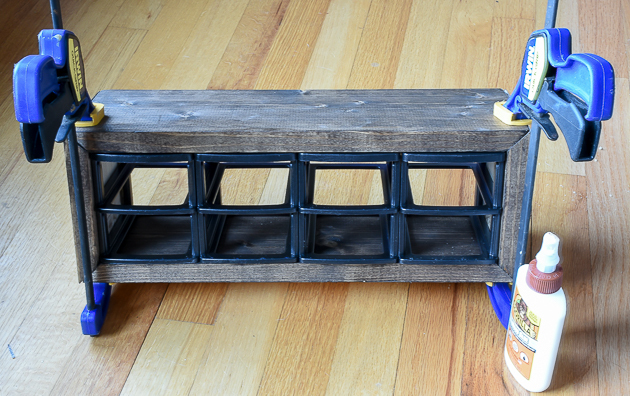 I also stained each of the four pieces of wood with Espresso stain then let everything dry. I didn't worry too much about coating the entire frames since the front and inside is all you will see. Once the frames were dry, I used DAP all purpose glue to glue the four frames together. 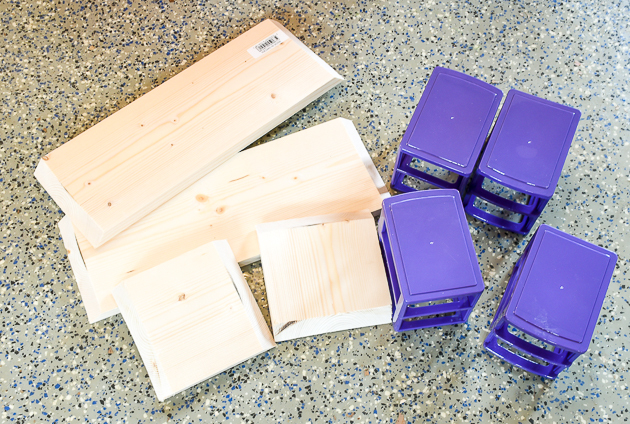 I was being lazy, so I only used wood glue to attach the wood frame to the storage drawers. 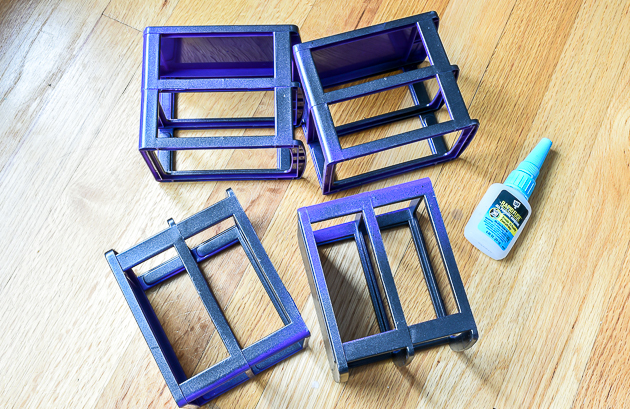 I simply added glue to the top and bottom of the Dollar Tree bins and to the four mitered ends of the wood. I clamped everything together and let it dry overnight. 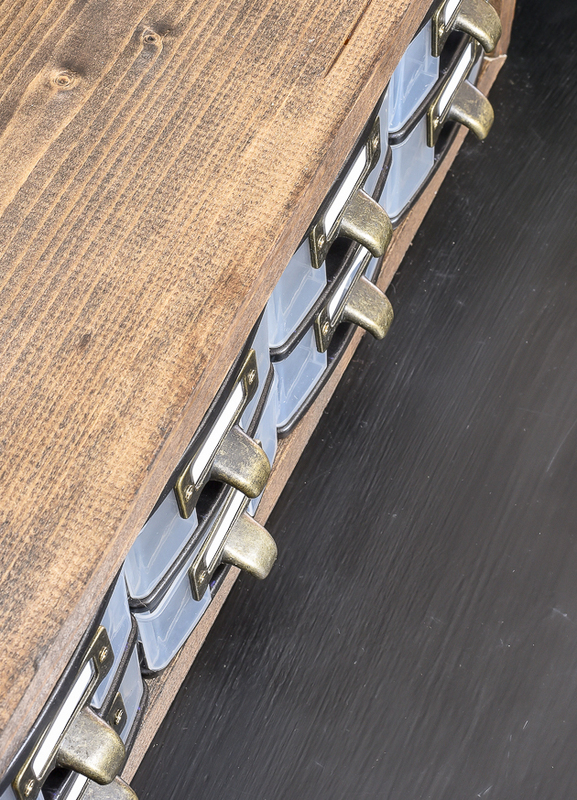 ***TIP*** If you want a sturdier hold you can add a few nails to each joint using a brad nailer. While the glue was drying I used a small screwdriver to attach a bronze label pull to each drawer. ***TIP** The nails will stick through the plastic, but a dab of hot glue on the end will keep them from being sharp and pointy. After I had all the hardware attached I inserted all the drawers and placed the storage organizer on my freshly cleaned desk. 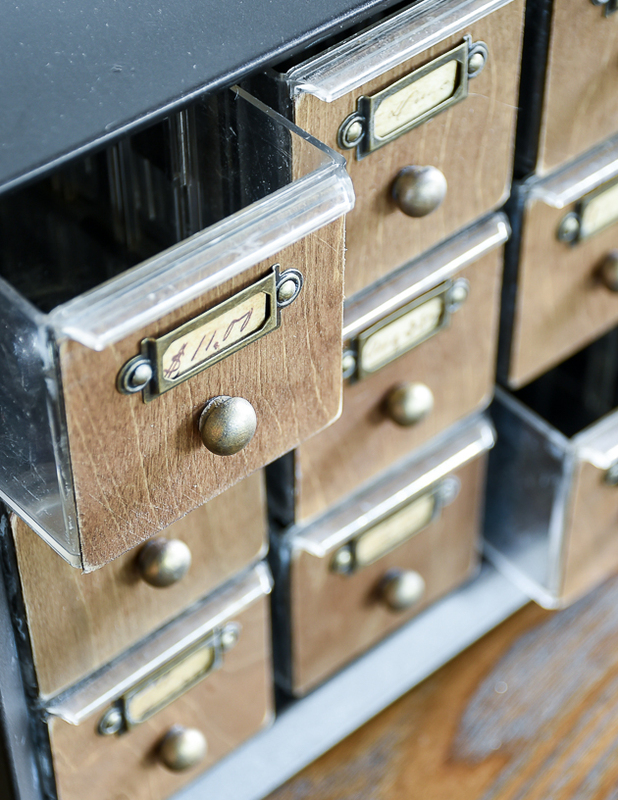 The drawers are currently empty, but will soon be filled with some of my most used hardware, labels and pulls. 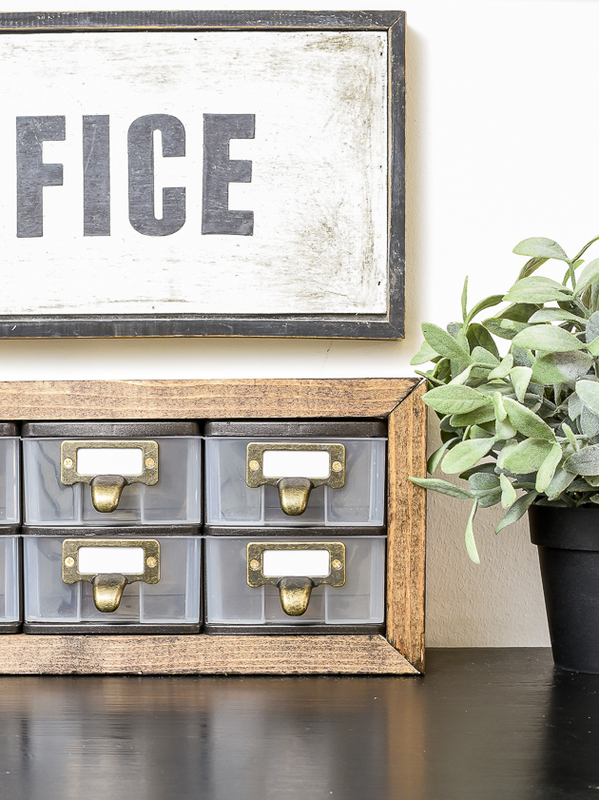 Clearly, I have a "thing" for multi-drawer storage units and this Dollar Tree makeover is a great addition to my collection of organizers. Clever! 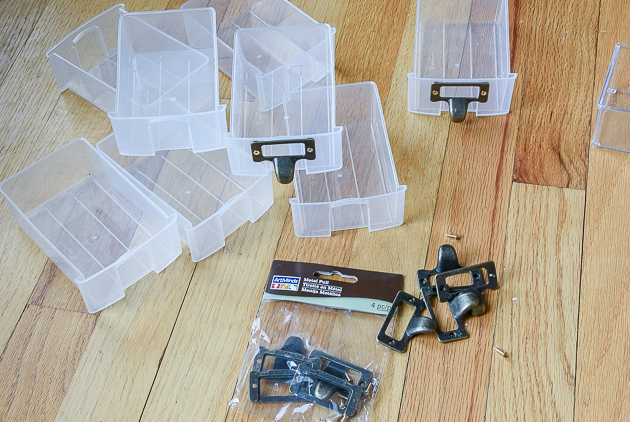 These would be so useful for any crafter/artist. Make several this size and stack them for a card catalogue look. 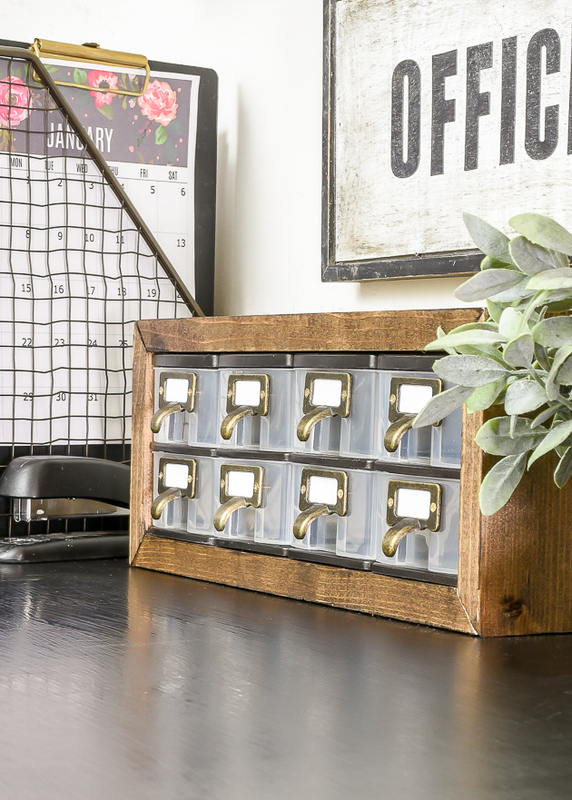 Great way to kickoff the new year, all organized. I love this! 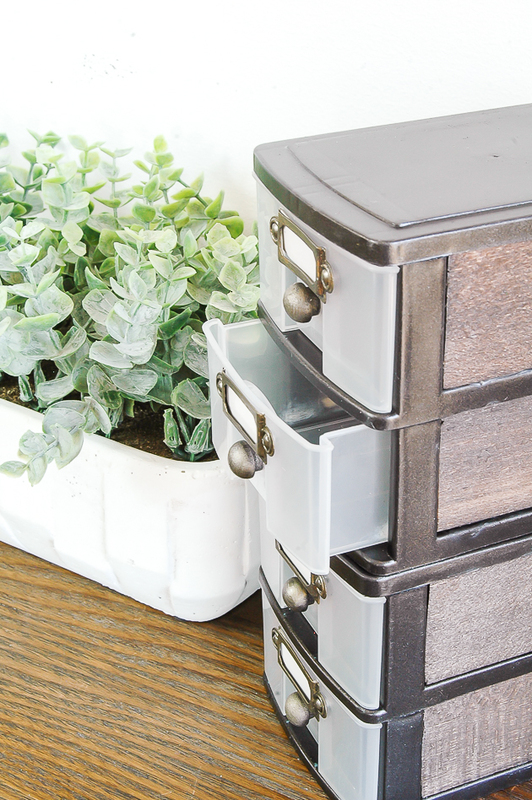 Such a great way to give those (super useful but not very stylish) plastic bins a facelift! 💕 Thanks so much for the idea! I think I'll paint the drawers with an opaque color.